Ge 50 led c-9 lights multi-color | energy smart up to 80% energy savings | constanton set continues to operate even if a bulb is burned out or loose | 32.6-feet. 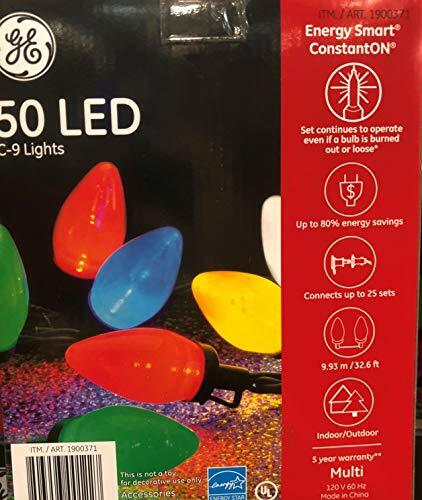 Connect up to 25 sets | indoor/outdoor use | outline your tree, ceiling, or roofline with the festive ge 50 led c-9 lights energy smart constanton 32.6-ft multi-color, for the season. Illuminate the night with 20,000 ours of constant light with energy star leds to shine throughout the holiday, strung with quick connect green cord to blend well with tree, landscaping, and can connect with multiple lights for even more decorating. Create a nostalgic festive feel with the multi-colored bulbs that feature light strands that can connect up to sets. Product details: ge 50 leds c-9 multi-color lights. Energy smart. Constanton set continues to operate even if a bulb is burned out or loose. Connect up ti 25 sets. 32.6 ft (9.93 m). 8 inch between each light. Indoor/outdoor use. 120 v 60hz. Energy star. Total wattage 7.5 watts.